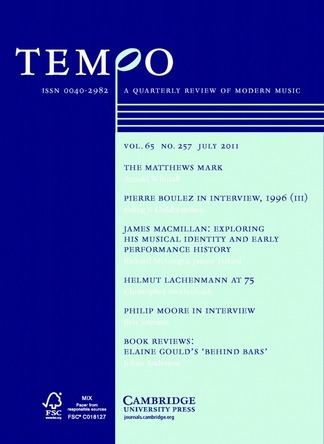 My article, ‘Into the Lion’s Den: Helmut Lachenmann at 75’, published in the July issue of Tempo, is now available from Cambridge Journals Online. The piece takes a look at Lachenmann’s reception in the Anglophone music world as well as touching on his musical and aesthetic development. It is unfortunately necessarily superficial in some respects, but hopefully will offer a slightly more current perspective on the state of research into his music and writings than was previously available. Access to Cambridge Journals Online is restricted to those with subscriptions or institutional memberships, so if anyone is interested and can’t access the article this way, please get in touch.